Bill Stenger's turn at the Central Florida Racing Complex Mardi Drift festival this past weekend ended in a decisive, if not totally unimpressive, fashion when his Nissan S14 turned a sick rail grind along the track's outer wall. Stenger had just done a batch of donuts alongside contest winner Kevin Lawrence's AE86 when he went wide and rode up the wall. 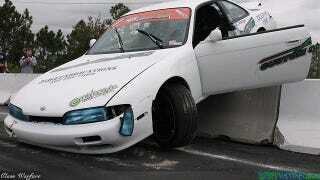 The Zenki is clearly going to need major work before its next public appearance. Stenger was unhurt, although his first priority after the incident was allegedly to find a cheeseburger. Video of the incident has been posted on Facebook and drifthappens.com has pics of the event and aftermath. Someone get that man a cheeseburger.